Official development assistance (ODA, or aid) is a critical resource for improving nutrition outcomes in developing countries. It can target those most in need, address their immediate requirements and combat the underlying determinants of poor nutrition in the longer term. DFID disbursed a total of US$840 million of nutrition ODA in 2013; this is a major increase (74%) from the previous year’s spending of US$482 million, which is in line with an upward trend since 2010 (the period covered by the analysis). In 2013 DFID disbursed US$105 million to nutrition-specific activities and an additional US$735 million to nutrition-sensitive projects. Both DFID’s nutrition-specific and nutrition-sensitive spending has increased annually – by 163% and 142%, respectively, since 2010. 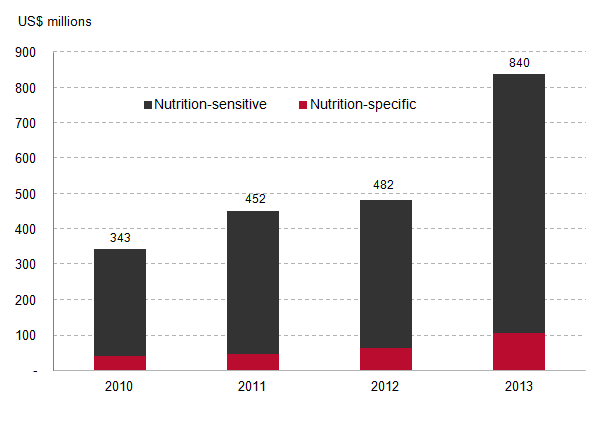 The scale of DFID’s nutrition-sensitive ODA is consistently greater than its nutrition-specific spending – more than 7 times greater over the period. Tracking donor ODA for improving nutrition is important to understand how much they spend and where these resources go, for leveraging additional investments from other actors, and to facilitate accountability at all levels. Tracking is also a challenge. Most approaches begin with the Organisation for Economic Co-operation and Development (OECD) Development Assistance Committee (DAC) Creditor Reporting System (CRS), to which DAC member countries report their ODA spending in detail using prescriptive ‘sector’ and ‘purpose’ categories and codes. These allow the identification of nutrition-specific interventions. To identify and track donor spending on broader nutrition-sensitive interventions, there have emerged various efforts to capture other relevant activities amongst the established CRS reporting system. Perhaps the most widely endorsed approach for doing so is the SUN Donor Network approach, used here and adopted by several donors to report spending to the Global Nutrition Report. The accurate tracking of all donors’ spending plays a vital role in combating malnutrition by increasing accountability and providing essential knowledge to better allocate resources. The picture on who is spending what, where and when on nutrition should continue to improve. This could be achieved by better reporting by donors, clearer information on domestic public resources and more accountability from other public and private sources of finance. 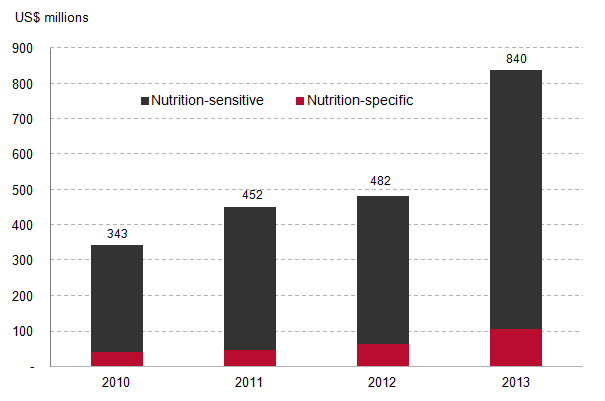 For more detail on this methodology and for more findings, see DFID’s aid spending for nutrition: 2013. DFID disburses the majority of the UK’s ODA, including for nutrition – 83% of the UK’s total ODA and 95% of the UK’s nutrition-specific ODA in 2013. Whilst this analysis gives insight into DFID’s nutrition spending, it is not able to consider the degree to which different nutrition-specific or nutrition-sensitive actions are effective at improving nutrition outcomes. All values are based on ODA disbursements and presented in constant 2013 prices.